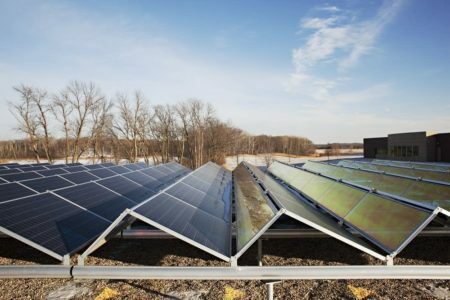 1,003 community solar proposals are awaiting action from Xcel Energy, Minnesota’s largest electric utility. “It’s bigger than anyone ever anticipated, and bigger things are coming,” said [Ellen] Anderson, who, before joining academia, spent decades working on Minnesota energy policy as a state senator, as chairwoman of the Minnesota Public Utilities Commission and as senior policy adviser to Gov. Mark Dayton (D). Anderson was among the more than 80 people, both experts and neophytes, gathered here last week for the last of four regional workshops on community solar sponsored by the Department of Energy’s National Community Solar Partnership. Click to read more. This entry was posted in Nebraska / Midwest News, NewsBlog and tagged Associated Press, Climate Wire, EDM Digest, KETV, Midwest Energy News, Nebraska TV, Nebraskans for Solar, NET Nebraska, U.S. renewable energy development, Utility Dive on June 28, 2016 by Helen Deffenbacher.